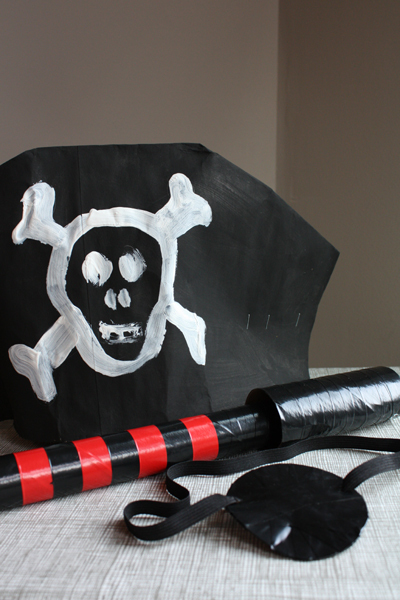 Ahoy, Make Crafts for Talk Like a Pirate Day! Shiver me timbers! There’s actually a day called Talk Like a Pirate Day. Arrrr! Indeed, you can read more about it here. Celebrate with the kids on Saturday, September 19 with these quick crafts made from supplies likely to be found around the house. Make a hat, spy scope and an eye patch. We enjoyed making these and I really can’t stop talking like a pirate. Arrrr! 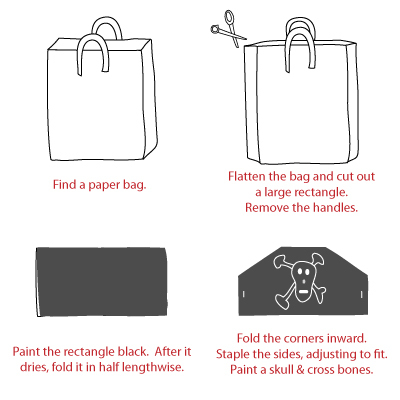 This pirate gear would also work well for a quick Halloween costume and the hats could be a simple craft for a pirate-themed birthday party if you just paint the bags beforehand. And the hats will fit adults too! Listen up mateys, here’s how to make the booty. Simply cut an eye patch shape from the cardboard and wrap it with the electrical tape, being careful not to stretch as you wrap or it will curve your eye patch. Poke a hole in either end and thread elastic or string through the holes, adjust to fit, and tie off the ends. Wrap the electrical tape around the longer tube in a striped design. Stop at the point where you’ll add your smaller end piece and leave that part cardboard (so the glue will adhere). 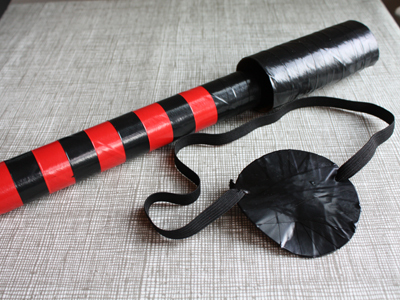 Then wrap your smaller piece with the black electrical tape. Attach the smaller piece to the end with the glue and allow it to dry. Go spy some scallywags! 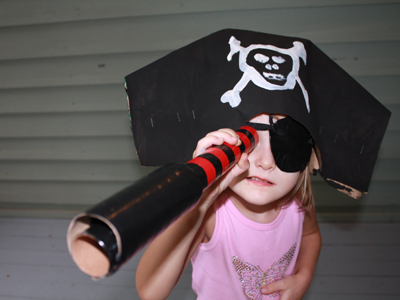 Find more Talk Like a Pirate Day ideas here! Ellen Luckett Baker is the author of the long thread, a blog about handmade goods. She has always enjoyed making things, but the flexibility of staying at home with her two daughters along with the creative inspiration they provide has led her to craft on a daily basis. Combining her love of graphic design and sewing, she has created an Etsy shop selling machine embroidery designs and sewing patterns. Ellen lives in Atlanta with her husband and two young daughters. She holds a B.A. in Art History and a Master’s of Public Administration with a focus in Non-Profit Management. Ellen recently wrote 1, 2, 3 Sew: Build Your Skills with 33 Simple Sewing Projects her crafting book. She is crazy talented! Love it! 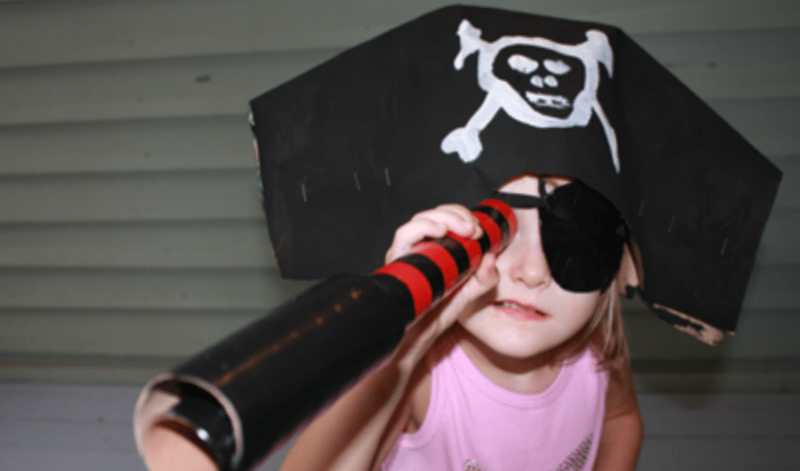 My preschooler doesn’t quite get pirates yet, but we’ll certainly be celebrating next year!